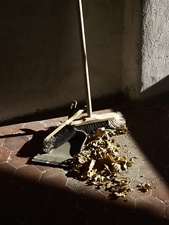 To begin your spring cleaning, grab the dust pan and broom. Most people cannot wait until the arrival of spring. Not only does it bring sunshine, but it's a great time to clean. Spring clean up includes cleaning out your closets and cleaning the inside and outside of your home. Some people enjoy spring cleaning. It's a good time to go throw out papers, magazines, and newspapers. Recycle what you can -- shred the other stuff. There's no reason to hold onto information if you have not read it in a year! Spring clean up can be used as a way to clear out the cobwebs of your life. When in doubt, throw it out. It's time to get rid of clothes you have not worn in many years. If they are gently worn, donate them to a charity. If they have holes, toss them out. Clear out the debris from your garden and flower beds. Sweep up twigs and leaves. Shred documents you do not need anymore. Use disinfectants to clean the kitchen and bathroom. Try to use natural based ones. Furniture polish will brighten the woodwork. Use mops, sponges, and rags. Sweep up debris on the patio and in the driveway. You'll need some cleaning supplies for your spring clean up. To clean the inside of your house you'll need a vacuum, mop, sponges, disinfectants, furniture polish, rags, and window cleaner. Dust the books, book shelves, knickknacks, lamps, and lampshades. If you notice a spot on the carpet, use a stain remover or club soda. Vacuum your carpets, rugs, and couches. Remove cushions and take out the chips, coins, any anything else that may have fallen between them. Mop the floors of your bathrooms and kitchen. After all, cleaning your living area is part of spring clean up. Spring clean up also includes removing drapes, curtains, and blinds. Wash down windowsills and wash the windows inside and out. Don't forget to clean the corners of the windowsills; dust and dirt builds up over time. Gardens and flower beds can use a spring clean up as well. Twigs and leaves find their way into your yard during the winter months. Clear away rocks and stones that have been kicked up. Once you're done, you can plant your gardens and flowers. Prepare the patio by hosing and sweeping it down. Clean the patio furniture with soap and water. Wipe it down as best as you can; you'll need plenty of rags. You can stick the furniture in the sun to dry. If the stuffing is coming out of the cushions, replace them. Usher in spring with a clean home. Do not hold onto to stuff that you do not use. Clear away as much clutter as you can. You may give the walls a new look. Remember that spring is the time for new beginnings. If you've been feeling stuck lately, take a look at your surroundings. Release items that you no longer need or serve you. Begin your spring clean up today, tomorrow you'll feel better.